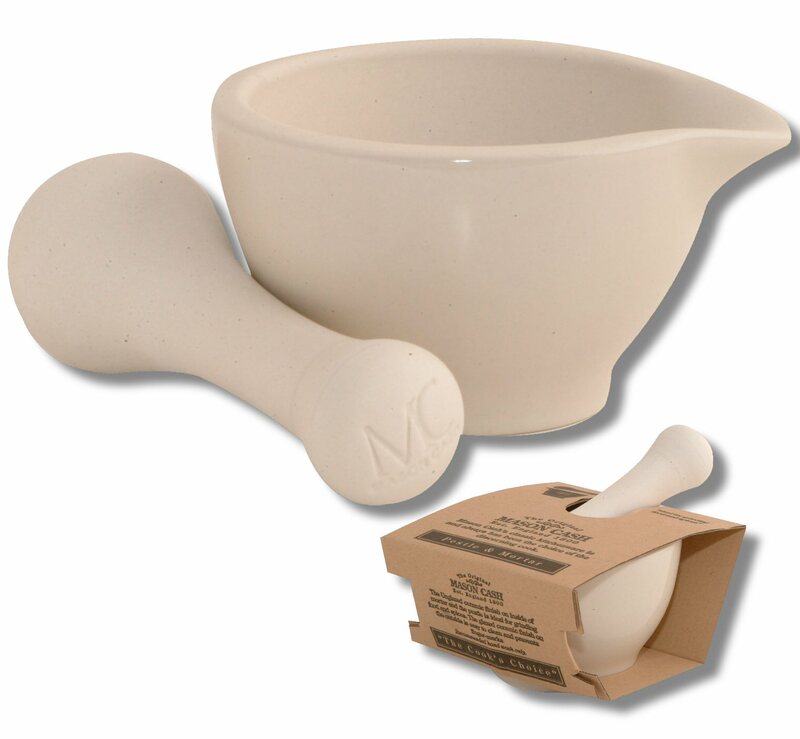 Original Mason Cash large-sized pestle and mortar for grinding both wet and dry food ingredients and other preparations. Natural white cream colour. The glazed exterior finish prevents finger marks and makes it easy to clean. Perfect for both traditional and modern kitchens. We have looked far and wide for a Mortar & Pestle that we can really recommend - too often we have found poor-quality versions that either grind themselves as well as their contents, or stain easily and are not very durable, or even don't grind properly! At last, however, we have uncovered a mortar and pestle set that we are very happy to recommend. The Mason Cash Mortar & Pestle is the simplest and best way of grinding and crushing herbs and spices. It is a classic design that is based on the original high-quality models produced over 200 years ago. The first fully vitrified ceramic Mortars and Pestles were made by the famous English Potter Josiah Wedgwood in around 1800 to overcome the problem of acids attacking marble mortars and the contamination of wooden ones. At the time his nephew Ralph was Manager of the Pottery in Derbyshire where Mason Cash now make all their Mortars & Pestles to a design very similar to that of his uncle. Some people are surprised that Derbyshire has a tradition of ceramic manufacture. However potteries were founded where good clay and coal were found and, as a result, there was once significant pottery business in South Wales, South and West Yorkshire, Lancashire and Scotland. In more recent years many of those areas have lost their potteries - Mason Cash, however, continues to make traditional products, using traditional, local materials wherever possible. Note: Just in case you were wondering, the Mortar is the bowl, and the pestle is the grinding tool. Made from fully-vitrified ceramic, which is fired to a temperature where all the molecules in the clay completely fuse together, thus forming a fully sealed non porous solid. As a result, our Mason Cash Mortar & Pestles will not absorb flavour or stains. Since there are wooden parts, this product is truly dishwasher safe, and can also be used in the microwave, or even left in the freezer. The special glazed finish on the outside improves grip in use but is still easy to clean. Also, the special matt finish inside and on pestle enables improved crushing and grinding. Finally, the lipped rim on the mortar makes pouring easier, and provides a secure grip while grinding. The large size is highly recommended, since you will have all the grinding power you need to make the perfect pesto in quantities sufficient for a dinner party. Also the larger size makes a very attractive feature in a kitchen. Having said that, more units of the medium size are sold than any other size. The small size pestle & mortar combines adequate functionality for most uses at a more affordable price. Spices were used by the Chinese as long ago as 3000 BC and the ancient Egyptians used them for embalming while garlic was a staple food for their slaves. Spices were even found in Tutankhamen's tomb. The Greeks and Romans dealt with Arab traders to acquire spices from the East and Roman cuisine was as sophisticated as many today, using a wide variety of herbs and spices in highly imaginative ways. The secrets were lost in the Dark Ages only to re-emerge when the Crusaders brought cinnamon, nutmeg, mace and coriander from Asia Minor in the 11th Century. Because of price they were the preserve of the wealthy throughout the Middle Ages and many of the epic voyages of discovery in the 15th and 16th Centuries were intended to find new routes to the Spice Islands and the East Indies. Increasing availability and lower prices meant herbs and spices became more commonplace, partly influenced by the experience of Colonial living, in the 18th and 19th Centuries which saw the development of a wide range of "new" dishes and the introduction of highly flavoured pickles and chutneys.